In the wild degus live in the Andes mountains in Chili. 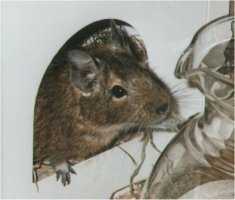 Halfway the 18th century Europeans discovered the degu. They first thought the degu was related to the squirrel, but later they found out that the degu was related to the guinea pig, which also comes from Chili. At first degus were imported to keep them in the zoo, and for experimental purposes (degus are very sensitive to diabetes, so they are ideal for experiments with diabetes). Later on the degu was dicovered to be a nice pet. In Chili degus are seen as a plague, for they ruin farmers by eating their crops. In the wild degus live in big groups, so there's not much of these crops left if degus start eating them.